Perfect For Displaying Multiple Restaurant Menu Items & POP Sale Items! Just Insert Your Semi-Rigid or Rigid Graphics! Quickly Display Your Ad On Counter Tops! Acrylic sign holders. Acrylic sign frames and plastic sign displays are the most economical clear sign holders. 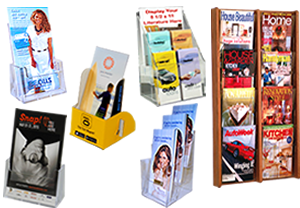 These plastic sign holders are a perfect way of displaying your ad when you have a limited budget and need to advertise your sales promotion at a low price. 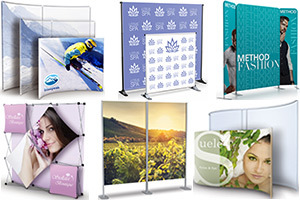 Styles available are angled frames, curved frames and upright table tents. 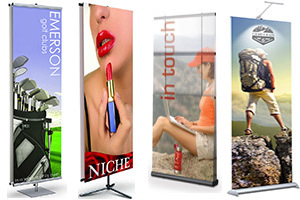 Sizes range anywhere from 3" x 5" to 17" x 11" frames. Clamp Base Signs. These clamp base sign holders will enable you to clamp your promotional sign to virtually any type of display table or table top. Suitable for round tubes from 7/8” to 1-3/4” and flat surfaces from 5/8” to 2-1/2” and 4” risers. Metal clamp has grip range up to 2 1/4". Top entry slot for easy graphic insertion. Clip-On Signs. Choose from sign post table grips that enable quick graphic change-outs and are perfect sign holders for point-of-sale advertising. Our merchandising sign clamps stand (clamp facing up) on counter tops and will hold any small sign straight up. Our magnetic table spinners with grippers which are perfect for displaying on cars or any other steel surfaces. Store Counter Sign Holders. 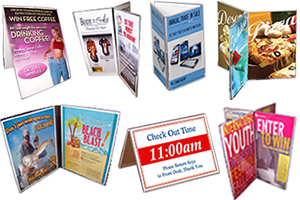 Retail counter sign holders come in a multitude of styles and sizes. 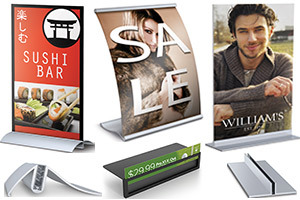 These eye-catching black and silver framed counter signs will make your promotions pop. 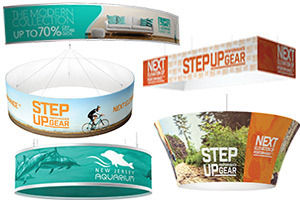 Grab attention and gain competitive advantage in your marketplace by differentiating your visual merchandising with these beautifully designed merchandising sign frames. 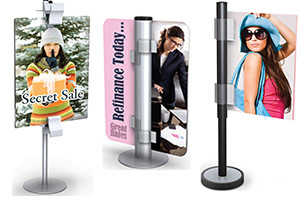 These sign holders are perfect for brightly displaying your promotions, pricing and brand messages. Multi-Panel Menu Sign Holders. These menu signs hold from 2 - 8 graphics. Styles available are table tent, triangle, spindle, book style frames. 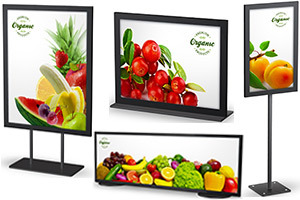 Most commonly used for displaying promotions and daily specials in restaurants and bars. Sign Mounts, Bases. 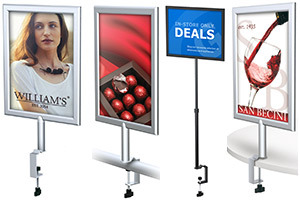 These frame-less sign bases are made for holding rigid & semi-rigid signs and graphics. Available in plastic and aluminum sign bases. 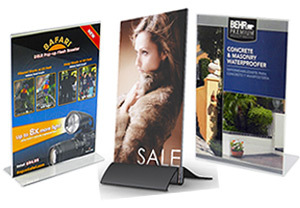 Affordable Display Products, Inc. offers a large selection of retail counter sign holders and frame styles that will meet the needs of most businesses. Please browse our website and if you have any questions our customer service representatives are here to help you. Just call, email or fax us. We are here to serve you. Please call our office today @ 866-550-0656 with any questions or if you cannot find what you are looking for on our website. Our knowledgeable customer service representatives will help direct you in the right direction and help you find the sign holder you are looking for.